I've seen similar setups in other similar circuits and can guess that it's related to one being polarized an one not, but I don't really understand what's going on there. That circuit uses "overkill" with that application but serves as an OK example. It can be seen on page 22 that having two capacitors at Vin abd two at Vout is not necessarily a standard arrangement, and that the capacitor values in the supplied circuit are relatively large. Below is fig22 from the datasheet. A large capacitor like the 2200 uF act as a "reservoir" to store energy from the rough DC out of the bridge rectifier. The larger the capacitor the less ripple and the more constant the DC. When large current peaks are drawn the capacitor supplied surge energy helps the regulator not sag in output. The white and black bars on the capacitor symbol show that it is a "polar " capacitor - it only works with + and - on the selected ends. Such capacitors are usually "electrolytic capacitors". These have good ability to filter out low frequency ripple and to respond to reasonably fast load changes. By itself it is not enough to do the whole job as it is not good at filtering higher frequency noise because electrolytics tend to have large internal inductance + large (relatively) internal series resistance (ESR). The small input capacitor (here shown as u1 = 0.1 uF) will be non polarized and will usually nowadays be a multilayer ceramic capacitor with low ESR and low inductance giving it excellent high frequency response and noise filtering capabilities. By itself it is not enough to do the whole job as it cannot store enough energy to deal with the energy needed to filter out ripple changes and large load transients. The same applies in general terms to the output capacitors. C4 = 10 uF helps to supply any gross load changes thus taking some load off the regulator. It is not usually deemed necessary to have more than a very small capacitor here. Some modern regulators need a largish capacitor here for stability reasons but the LM78xx does not. Here the second output capacitor is 0.1 uF and it is there to deal with high frequency noise. Note that having a large capacitor on the output can cause problems. If the input was shorted so that power was removed C4 would discharge back through the regulator. Depending on voltage and capacitor size this can cause damage. One method of dealing with this is to provide a usually reverse-biased diode from regulator output to regulator input. If the regulator input is shorted to ground the output capacitor will discharge through the now forward biased diode. High value polarised capacitors typically do not have ideal characteristics at high frequencies (e.g. significant inductance), so it's fairly common to add a low value capacitor in parallel in situations where you need to worry about stability at high frequencies, as is the case with 78xx regulator ICs such as this. When you are thinking about a noisy signal at the regulator output, you have to use low-ESR rated (tantalum or ceramic) capacitors because they have very good noise suppression. But that is also depending upon which regulator you're using. The circuit mentioned in the link which you mentioned in your question is a full-wave bridge rectifier. Here in this circuit the capacitors acts as a filter. Which opposes the AC signal to flow through or appear at the output terminal. The designer used various capacitors in order to filter the signal in order to get the desired DC level. Here the capacitors are used across regulator inoder to obtain stability. At high frequencies the capacitors' behaviour were not stable or constant. So to get the stability the designer used the small-value capacitors along the higher-value capacitors. Not the answer you're looking for? Browse other questions tagged power-supply capacitor or ask your own question. Why does an LC-filter need two different capacitors and how do we calculate their values? Why don't we use capacitors containing multiple kinds of dielectric in a single package? 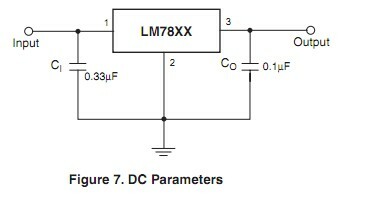 What do the capacitors on IN and OUT of an LM7805 voltage regulator? Why too many capacitors in parallel for Vdd supply net? Can't we just add all to replace with one big capacitor? Why have a 0.1 uF capacitor in parallel with 2500 uF in a power supply filter?